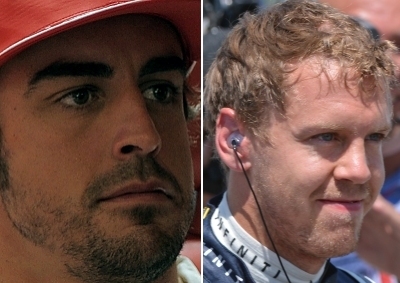 Vettel, Alonso - F1 powerhouse? TWO ROOSTERS IN A HENHOUSE: Fernando Alonso (L) and Sebastian Vettel could be one of the strongest F1 driver pairings should the Red Bull ace move to Ferrari. BERLIN, Germany - Red Bull's Sebastian Vettel has momentum on his side after taking the 2012 Formula 1 championship lead from Ferrari's Fernando Alonso. Vettel posted a hat-trick victory in South Korea to dethrone Alonso and take a nine-point lead over the Ferrari driver into the final four races of the season. The BBC reported that Vettel had signed a pre-contract to join the famed Italian team in 2014, if his 2013 results are good enough. The report also said Alonso had approved of Vettel joining Ferrari which, if it became reality, would be the strongest drivers' line-up in a current F1 team. Ferrari and Red Bull were quick to dismiss the report. Ferrari president Luca di Montezemolo said: "The 2013 season has yet to come but I don't want to have two roosters in the same henhouse, rather two drivers who race for Ferrari and not for themselves. I don't want problems and rivalries." Red Bull team principal Christian Horner said: "Sebastian Vettel, without a shadow of doubt, will be part of the Red Bull Racing team in 2014." Vettel and Red Bull have always denied that the German has an agreement with Ferrari and that their deal runs until the end of 2014 - however, with a get-out clause. Felipe Massa is the second Ferrari driver and expected to stay as No.2 for 2013 after a few good race results. Alonso has a contract until 2016 but has yet to win a title for Ferrari; his trophies in 2005 and 2006 were with Renault. Alonso came close in 2010 but lost to Vettel in the final race of the season. Vettel appears to have the upper hand again after his dominant showing in recent weeks which culminated in Red Bull's first 1-2. He said: "I think we have done another step - I hope we can carry that momentum through to the next races." The Red Bull driver could wrap up a third title at the penultimate season race in Texas, USA, in November 2012. Vettel again: "We had a good previous couple of races but you know we've seen the championship is pretty much up and down, a lot of things can happen." Alonso will not go down without a fight and Ferrari was happy enough with his third and Massa's fourth which allowed them to overtake McLaren for second in the F1 Constructors' championship. Alonso said: "I think we have to be happy with the performance, we finished third and fourth, just behind Red Bull that at the moment are difficult to beat. "We are moving in the right direction. We just need a little last step to be as competitive as Red Bull and I think it will be a beautiful last four races to the end." McLaren, by contrast, suffered a nightmare race in Korea, with Jenson Button retiring on the first lap and Lewis Hamilton finishing 10th after starting from third. Hamilton made three pit stops due to suspension problems and ended the race with a piece of Astroturf from the side of the Yeongam track wtuck under his car. Hamilton is 62 points behind Vettel and believes he no has a chance at the title. The same applies to Button, 84 points off the pace, with only a maximum 100 left on offer in 2012. Hamilton said: "I think that's it for us. We were still in the fight until now." The title race is very much a two-man affair as third-placed Lotus' Kimi Raikkonen, the last driver to win a championship for Ferrari (2007), is 48 points behind Vettel. BMW's new 4 Series in SA, best-selling luxury SUVs, 12 Porsche sports cars damaged in a blaze... take a look at some of the top motoring stories this week. 'If you're looking for a bike that can serve as a commuter during the week and carve up a track over weekends, this may well be it,' writes Dries Van Der Walt as he ride Kawasaki's Z900.